Usually, gardeners wax poetic about the blooms of this month, but the middle of June is kind of a weird time in my garden. The irises are already done, including my gorgeous 'Samurai Warrior' red iris, and the only other typical mid-June bloomer that puts on a show for me is my 'Dortmund' rose. 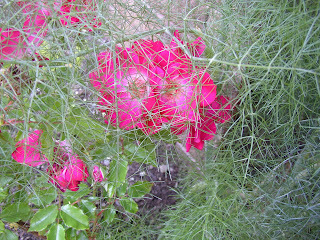 Here you see 'Dortmund's lower blooms, the first ones to open, partially obscured by bronze fennel foliage. Outside of the rose, the only other really showy thing in my garden is a stand of goatsbeard (aruncus sinensis 'Zweiweltenkind') plants. The goatsbeard is very pretty, but even if you don't like the flowers themselves, they are amazing to see in bloom due to their size. The 6-strong clumps flower at about 4ft in height! My 'Samobor' geraniums still have a few delicate blooms holding on, but most of the flowering stems were cut back a week or more ago. 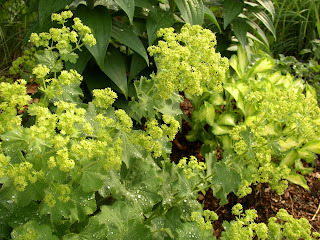 One of my lady's mantle had to be deadheaded when its great chartreuse blooms turned brown. A second lady's mantle is sporting a new haircut ever since I decided to move it (which was cause for a huge pouting--er, wilting--episode) last week. But the other alchemilla mollis is still blooming nicely, with the variegated sedum behind it picking up its color for a 1-2 punch. The abutilon megapotanicum that I grew in the house over the winter was cut back severely this spring when it was shipped outside, but it seems to be much happier in its new, sunny situation. Across the driveway from the pot of parlor maple, some cute little rock garden plants are starting to cover up the retaining wall block nicely. At left and bottom is the 'Chubby Fingers' sedum album, and in the middle top is a pretty gray creeping germander that I bought last year from High Country Gardens. To the right is the woolly thyme that makes me smile when I step on it to weed the bed behind--it has a very pretty, light scent. It's got scattered blooms in a color similar to the germander, too. 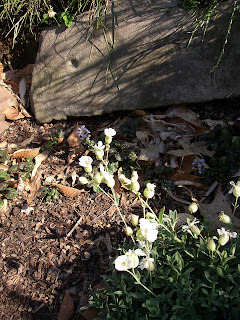 More rock garden plants are blooming in the backyard. Inside one of the "locks" is 'Metallica Crispa' ajuga and silene maritima. Behind the locks, the perennial snapdragons, saxifrage and 'Cape Blanco' sedums are settling into their new home, with the linaria not really missing a beat in terms of bloom. The front yard has some interesting blooms, too. 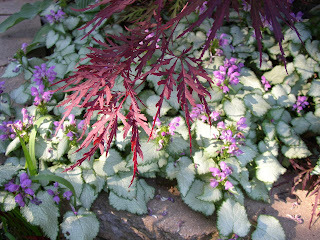 On the left side (streetside) of the Japanese maple, you can see the pretty contrast between the lacey Japanese maple leaves and the 'Purple Dragon' lamium that is planted underneath it. Moving around to the left (house side) of the maple, its lowest branches have started to grow together with my 'Northern Halo' hosta. 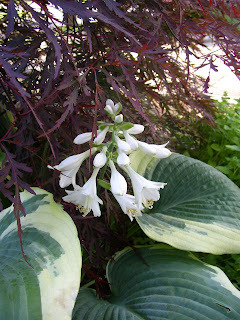 I usually cut off hosta flowers before they have a chance to really bloom, but for some reason these really work for me in conjunction with the cream-edged hosta and the Japanese maple foliage. So they get to stay. Other flowers that usually get cut before they can even bloom are those on my coralbells, but a few heuchera flowers got to stick around this spring as well. 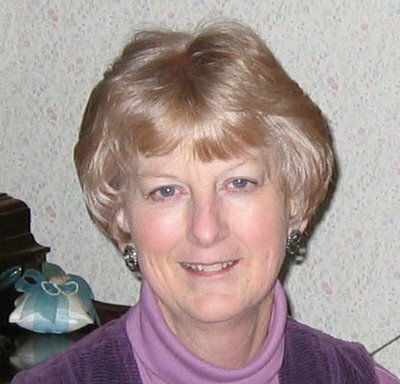 Maybe I'm getting soft in my old age? At the other end of the soft spectrum, the most unusual blooms around here are a funky little pink blossom on my cobweb sempervivum, and the little clustered flower/seedheads from my carex buchanii. 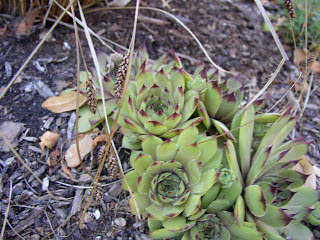 I couldn't get a really good picture of either (in the second shot, you see a few clusters cascading into the other sempervivum, below) but I think that this will look really interesting once the hens and chicks fill in. It has a natural xeriscape look to it that I really like. 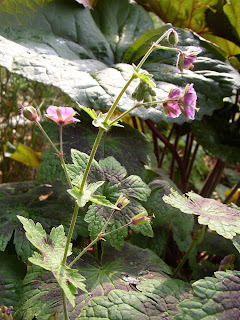 I love your germander and that red-and-yellow abutilon. I've seen that particular abutilon growing in Austin too, albeit in the shade. I've got to get one of those. Unusual and interesting stuff you have there! The cobweb sempervivum can bloom? I bought some this spring but never thought about flowers. Some of the hostas have such flimsy, mauvey flowers that I used to cut them off, too - but if they had some substance and/or were white, they stayed, and frequently had fragrance. It's good to see alchemilla again - hope they settle in after their move. The new design is Lock-ing Good. Is your variegatede Sedum 'Becka' (Autumn Delight)? I just planted one of those, so now I think I should move an Alchemilla over next to it, as yours look so great together. 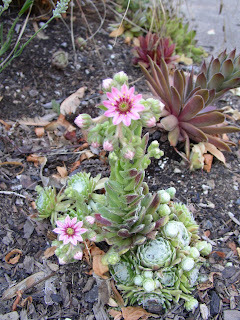 My Sempervivum hasn't bloomed in a couple of years, but I think it had brighter pink flowers than yours. I like the contrast between the petals & the maroon ring, which complements the other Sempervivum. Joey, thanks! All those things... they don't sound so miniature to me. lol. But they sure are pretty plants. 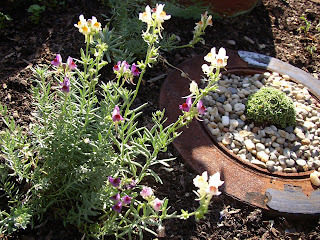 Pam/Diggin, I really love that germander, too. I meant to plant the abutilon outside (even though it isn't hardy here) but when I saw how nice it looked in front of the artemisia, pot and all, I relented. Funny thing is, though, that now that it's outside the red bleeds into the yellow when it rains. Annie, nice job on the pun! :) I don't think that these have fragrance, but they do have some presence. I do leave the pretty darker purple flowers on my miniature golden one, too, but all of the rest of them are rather nondescript and get cutback. It's so nice to see you excited about seeing "your old Northern garden plants" on our blogs... since we get so excited about seeing the tropical treasures that we can only dream about on yours! Gorgeous blooms Kim. You have lots blooming in your garden in June. A friend of mine cuts off her Hosta blooms too. She says that if she does this her hostas grow larger. I don't know if this is true but I usually leave mine. I have found that many of them have a lovely fragrance. 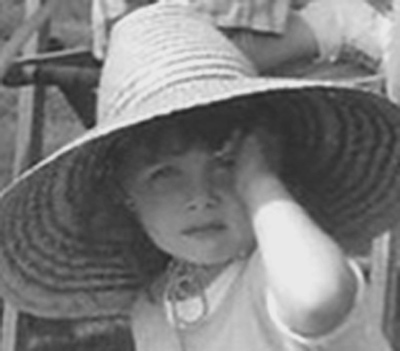 Happy bloom day. Is this yet another new style for your blog? Love it as always and the bloom day post has many interesting items. The picture of the Japanese thread leaf maple over your hosta is a beauty. I think you have been working too hard as I miss your frequent posting. Will make do with what you can manage! great to see your blooms. My roses are just starting, I still have my irises. Last year at this time I think both were done! I'd love to see more pics of your rock garden plants. Layanee, it is a new look. I'm still experimenting with something that I like, find to be clean, etc. And once I settle on something I will probably only change the header graphic to reflect current pictures each season... so maybe the changes will be ending soon. 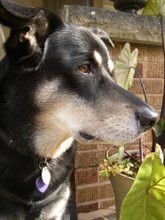 Thank you for the kind words about missing my posts. 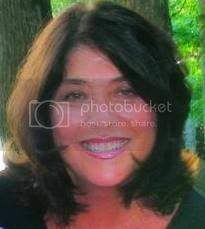 I miss posting, too, but am working on that--the garden center job will be ending fairly soon. Muum, I was kind of thinking that my roses were a little behind, too... but I think that my iris were spot-on in terms of last year. Now that you say that, I'll have to check. Wow, what different zones we live in! I've always admired goatsbeard - but from a distance, and few geraniums can manage it down here in the south. Your gardens look just beautiful - and makes me want to stop by with a pitcher of martinis for a real tour! You do have some interesting blooms, Kim. I love your a. megapotanicum. 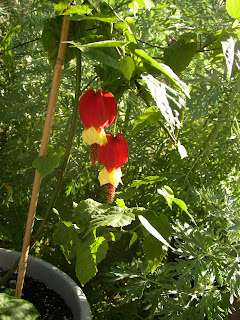 I was wondering what to do with the abutilon I wintered over, and thought of putting it in the ground, but now, seeing yours, I may leave it in the pot. And I'll cut it back. Did you try rooting the cuttings? I've heard it roots easily. 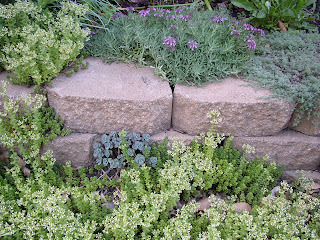 The germander and other rock garden plants look very pretty. Love the nice selection of blooms. It's fun to see so many different things blooming in everyone's gardens.